Bike Gob is ridiculously excited and has wet Bike Gob's urban apparel cut kecks. Although Bike Gob likes to ride Bike Gob's bike all year round no matter what the sky is doing, the summer time is the best of all times for riding Bike Gob's bike. As a result, lots of other gobs ride their bikes in summer too and so lots of totally ace gobs make ace things for bike gobs to do together during this summer that Bike Gob has just mentioned. 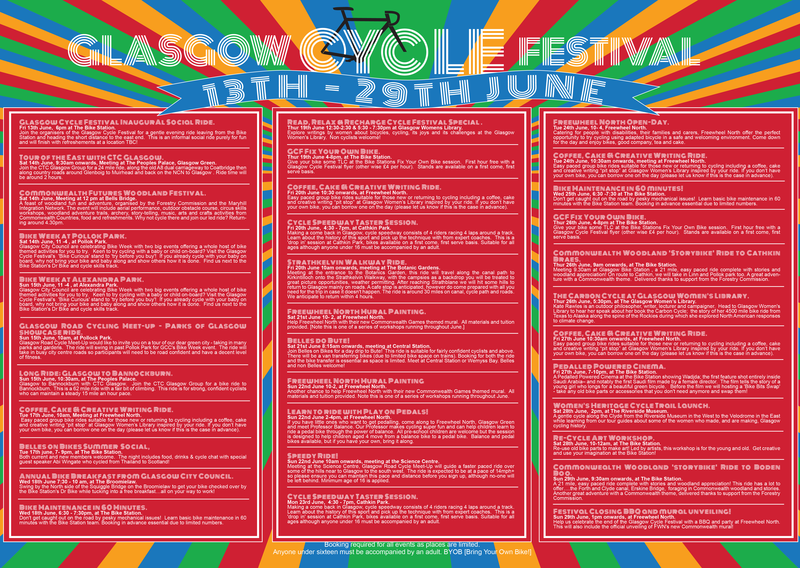 The next few months will see an insane amount of cycling events happening in our best of all the cities city, so to help make sure that you don't go crying to your mammy because you missed out on some, Bike Gob has made a Glasgow Cycling Gob Events Summer 2014 Calendar for gobs one and all. Mobile device users click here yo. Bike Gob thinks that you might find this a bit easier to read than the Glasgow Cycle Festival flyer currently doing the rounds on the internet, causing gobs all around Glasgow to wince in pain as they make the zoomy pinchy pinch with their fingers on their phones to no avail. Yeah, Bike Gob has got it covered. In honour of such looming excitement, Bike Gob will be doing a round up of the top picks of the summer events - hit list style - in the next few days. Until then though, Bike Gob is off to change Bike Gob's troosers. If you have a cycling gob event you want added to Bike Gob's Glasgow Cycling Gob Events Summer 2014 Calendar please contact Bike Gob who will put it in if Bike Gob thinks it is worthy of a place in Bike Gob's Glasgow Cycling Gob Events Summer 2014 Calendar.